Abdelhaleem Ashqar said he'd rather go to prison than disclose the secrets of Palestinian militants. On Wednesday, a federal judge in Chicago made that so. Ashqar was sentenced to 11 years in prison for criminal contempt and obstruction of justice after refusing to testify before a federal grand jury investigating Hamas support in the U.S.
Ashqar had been accused of racketeering for his alleged support for Hamas. Jurors acquitted him of the racketeering in February, but convicted him for contempt and obstruction for refusing to testify despite being granted immunity. 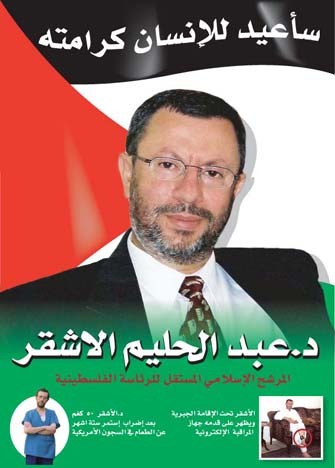 Fellow defendant Mohammed Salah, an acknowledged Hamas member, also was acquitted of racketeering. He was sentenced to 22 months in prison after being convicted of lying in a civil suit concerning Hamas support. In a sentencing hearing that began Nov. 8, prosecutors – who had asked for a life sentence - tried to show U.S. District Judge Amy St. Eve how Ashqar's refusal to testify impeded their investigation. They led FBI agent David Bray through a lengthy series of documents taken from Ashqar's apartment during a 2003 search. Those records included telephone and fax listings, some of which were related to Hamas. Had he testified, Bray said, Ashqar would have been asked about such documents. Attorney Stephen Landes, who was part of the legal team in the civil litigation, attended the earlier hearing and said the evidence presented showed "Ashqar certainly had critical information that could have guided investigations into numerous people. There's no question he was a very high ranking Hamas person in America. He had the ability to provide very useful information in exchange for immunity but he made his choice not to." In court papers, defense attorney William Moffitt argued Ashqar could not be sentenced to more than 10 years. Moffitt also argued that as a Palestinian, Ashqar could not testify. "He could either join with his oppressors, reject his countrymen, forsake everything he believes, and never return to his beloved Palestine, or he could be labeled a terrorist," Moffitt argued. According to the Associated Press, Ashqar spoke for nearly two hours before St. Eve issued his sentence. He discussed the suffering of Palestinian people under the Israeli occupation and said he preferred prison over giving up his information. "The only option was to become a traitor or collaborator and that is something that I can't do and will never do as long as I live," he told the court. St. Eve was not swayed. According to the Chicago Tribune, she told Ashqar the law required his testimony once immunity was granted. "You have disregarded your legal obligation." St. Eve told Ashqar. "In the 1 ½ hours that you have spoken, I have not seen any remorse from you. I also have heard exactly the opposite." Ashqar helped organize a 1993 gathering of Hamas members and supporters in Philadelphia that was called to discuss ways to "derail" the Oslo peace initiative. That meeting was part of the Palestine Committee, a conglomeration of Muslim Brotherhood affiliates in the U.S. In addition, investigators found "A suggested work paper" on "Re-arranging Frame of Work on the Inside" in Ashqar's home. The paper, originally in Arabic, describes the early years of Hamas and the coming together of Muslim Brotherhood and Hamas apparatus. The section addressing education lists one of its goals as "ending control of non-Islamists of educational institutions." Ashqar, formerly a business professor at Howard University, even ran for president of the Palestinian Authority in 2004, winning 20,000 votes, or about 3 percent of the votes cast. Ashqar's cause was taken up by a number of Islamist groups in America. CAIR-Chicago encouraged followers to attend the sentencing hearing, calling the case a political prosecution. Muslim American Society President Esam Omeish was among those who wrote St. Eve requesting lenience, saying "Never at any time did I sense a radical tone and an extremist agenda in his words or actions. He has never and from what I saw can never aide or abet any terrorist or help finance any act of terror, simply because he does not believe in violence and extremism as a way to voice disenfranchisement or disagreement."